I took this picture coming home from work on november 30th 2003 at 7:41pm. I seen a strange cluster of lights in the sky and i stopped to see if i could find out what it was.The lights were huge and bright orange and they were moving in and out of formations very tightly. I flagged down another car to see if someone could say what these were but the man and woman who i talked to were also curious and pulled of the road to watch these lights as they continued to move in formations. I remembered i had my daughters camera and i got into the car and pulled it out to take a picture of it before they ALL VANISHED AT 1 TIME. The objects were very strange and i have no idea what they were.. I know they were not military flares because military flares do not move around in the skies they simply fall to the ground. These lights moved left and right at different speeds and they all seemed to act as if they were all controlled by some source as they would all disappear and reappear at the same time each time in various formations. I snapped this picture of the objects in nightvision mode on the camera. 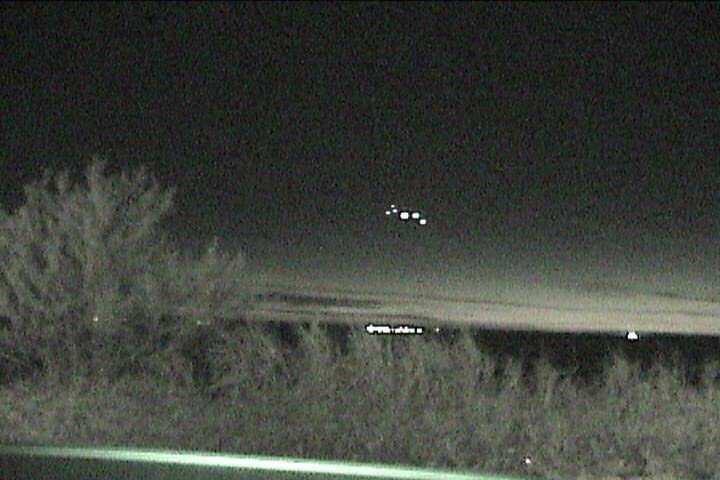 I was driving on highway 67 just east of Marfa Texas..
Do you think these were ufos of some type or could these be the famous marfa lights?! ?